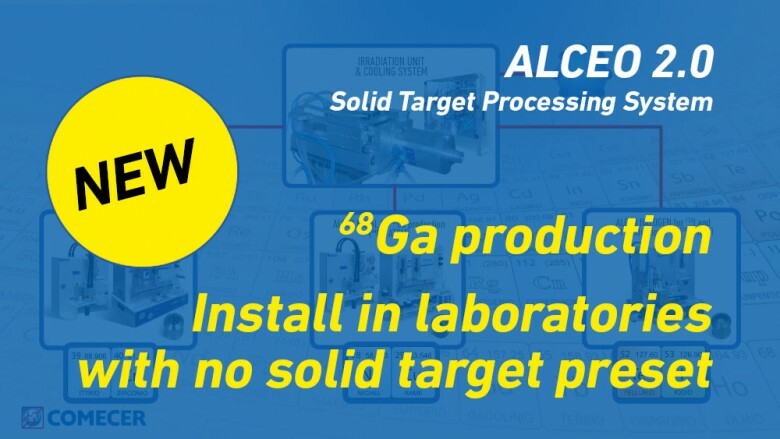 ALCEO 2.0 solid target processing system is an automatic equipment for the production of isotopes such as 64Cu, 89Zr, 124I or 123I and it has unique advantages in the field of solid target solutions. It does not require coin target handling or active element transportation between the Cyclotron and the hot cell. It does not require the installation of cells suited to handling with remote manipulators or tele-pliers thanks to the fully automatic management of the transfer, dissolution and purification process. It allows the production of different isotopes inside the same process module, thanks to a flexible approach in terms of chemistry and the removable disposable. It allows a reduction in the operator’s exposure to radiation thanks to the absence of manipulation, the presence of removable disposables and the automatic cleaning procedures integrated in the process. It includes all the process phases, such as plating, dissolution and purification within recipes optimised by Comecer for the various selected isotopes and included in the control system of the ALCEO 2.0 modules. It allows integration of transfer modules inside compact cells (BBS) that can also be managed in small-sized laboratories. Installation of an ALCEO 2.0 system in laboratories originally designed with no presetting for solid target. Thanks to the collaboration of the SAHMRI Centre in Adelaide, we were able to experiment a new automatic process for the production of 68Ga by bombarding enriched 68Zn using the ALCEO 2.0 system. 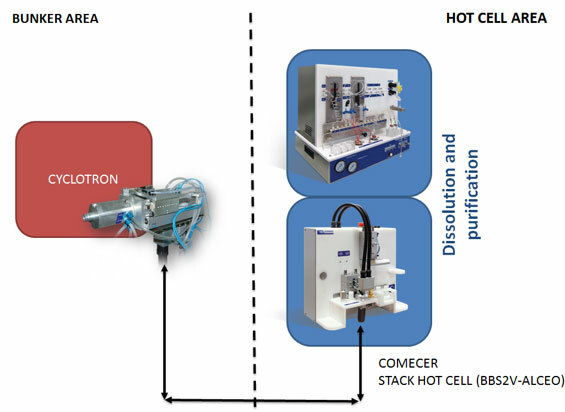 This new Ga/Zn process takes advantage of the technologies consolidated in Comecer’s solid target, and thus allows the range of metal isotopes supported by the module to be expanded by integrating 68Ga with 64Cu and 89Zr. Hence, the system entails a plating, irradiation, dissolution and purification phase that is fully automated and able to make the production of 68Ga easily usable and consistent, even when bombarding for a few hours. The results show how large quantities of 68GaCl2 can be produced, suited to labelling processes, consequently setting the foundations for future centralised production facilities of this isotope. In fact, the analysis of the saturation yields shows that the ALCEO 2.0 system is able to produce the equivalent of 13-15 Ga/Ge commercial generators in just a few hours. Additional details will be available at the EANM Comecer booth. 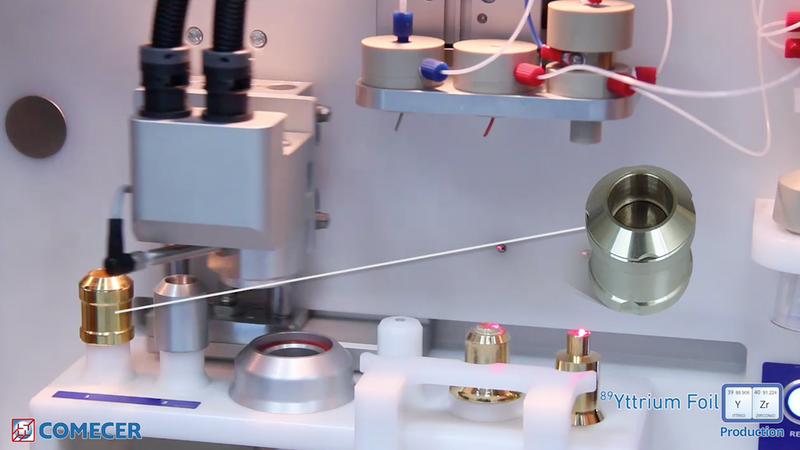 The ALCEO 2.0 METAL system is a solution suited for easy integration in new laboratories since the system is installed in two separate areas: the Cyclotron area, where the target (PTS unit) is installed, and the classified laboratory area, where the cell containing the process modules is installed. The two areas are connected by means of the pneumatic transfer tube that crosses the building in special shielded ducts (usually called trenches). For additional details, you can view this explanatory video clip (see above). 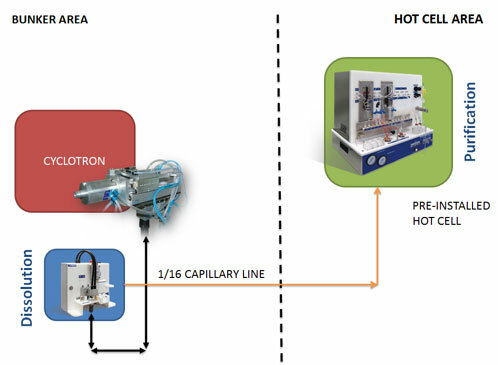 The implementation of the ALCEO 2.0 system requires laboratory layout planning, so as to allow proper positioning of the TARGET <-> MODULES connecting tube and the installation of a hot cell preset for connection to the solid target system. During the facility design phase, this request is easily managed and does not usually entail additional costs other than those incurred to purchase the process equipment. 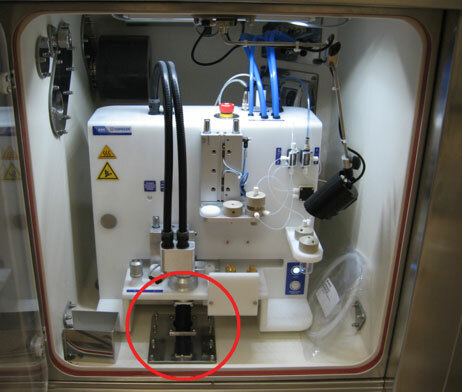 However, it is very complex and often not feasible to introduce a solid target system in pre-existing laboratories, where hot cells and trenches for capillary passage do not possess the requirements for proper installation of the ALCEO 2.0 system. Thanks to the particular nature of the chemical process and to the characteristics of the ALCEO 2.0 modules, t is now possible to separate the dissolution and purification phases into separate and distinct areas. 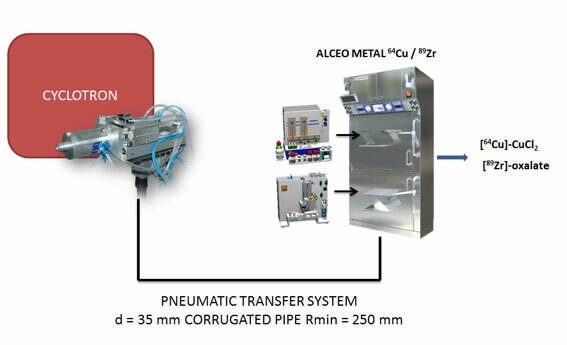 In this configuration, connection between the two areas consists of a single fluid transfer capillary and no longer of a complex pneumatic transfer system of the target using corrugated pipe. The dissolution system is housed in a small shielded compartment (small hot cell) positioned inside the bunker or near the Cyclotron. This small cell does not usually possess the requirements needed for installation in classified laboratories and consequently it is a cost-effective and easy-to-install solution. Its shielding protects the operator and the module against any neutron irradiation of the Cyclotron. Inside the bunker or technical area it is extremely simpler to find a way to connect the PTS target of the ALCEO 2.0 system to the dissolution system. In fact, the connecting tube used for the transfer travels in the large-sized trenches preset for installation of the Cyclotron, with no need for routing inside the shielded ducts for the transfer of radiofluids to the hot cells. The purification module, on the other hand, can be installed in a pre-existing cell for which the only requirements are the arrival of a regular radiofluid capillary (usually already present), the space needed to house the module and suitable shielding depending on the radioisotope to be produced. the introduction, in any case, of a safe transfer process that prevents contact with the Cyclotron target and consequently, heavy personnel exposure to radiation. Thanks to this new technical offer, the production of the entire range of metal isotopes, 64Cu, 89Zr and now even 68Ga, is finally available in facilities where the implementation of solid target systems was not deemed feasible.